OK! 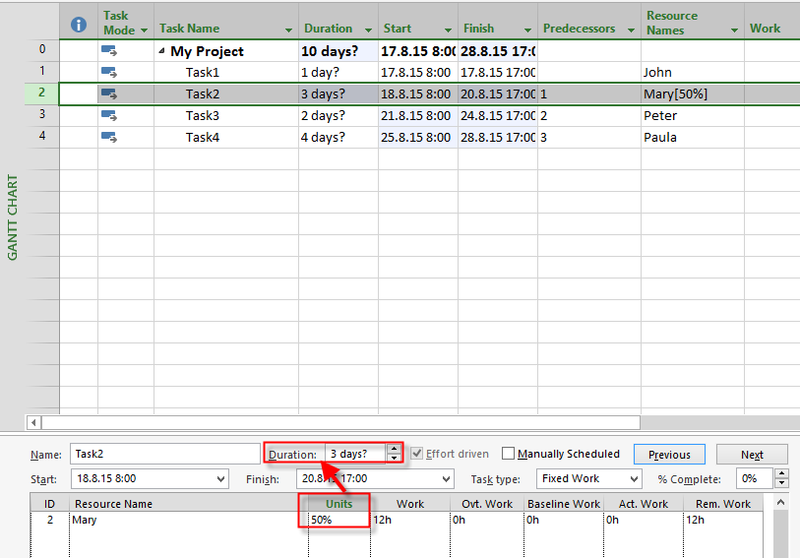 Let’s do it in MS PROJECT 2013! First, remember the Magic Formula: Work = Duration * Units! If you want to learn more about it, I wrote Blog Post about it, and I’m not going to repeat it here. 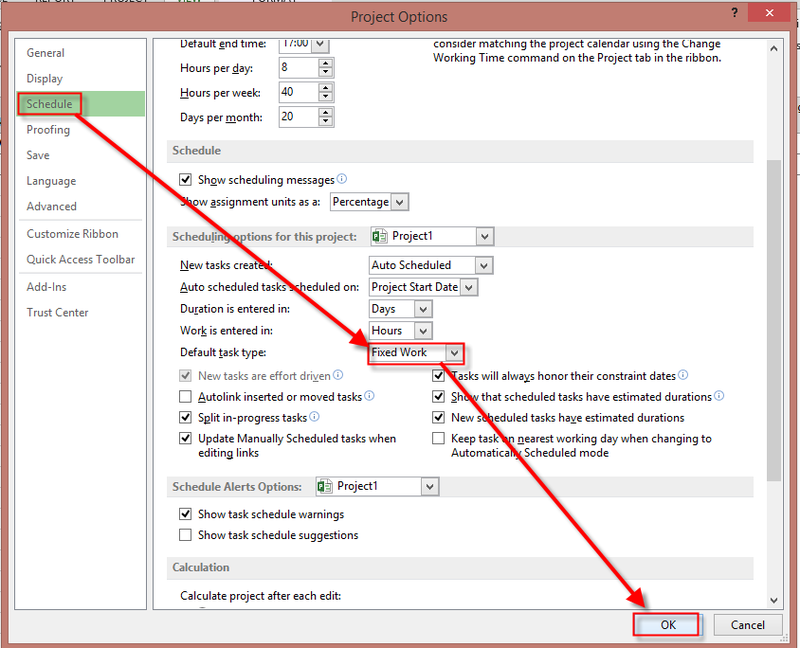 When you are estimating in hours, that means that Task Type is Fixed work! It doesn’t have to, but it’s logical! So, new Tasks are going to be Fixed Work. 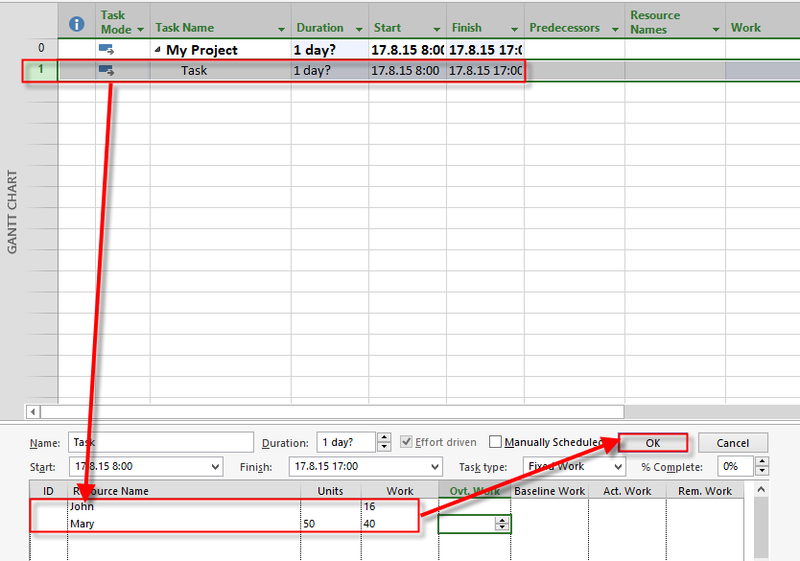 As you can see, Duration is Estimated for 1 day, no matter how many hours do I need for specific Task. That is because I do not have Units (I didn’t assign Resources). Be careful! 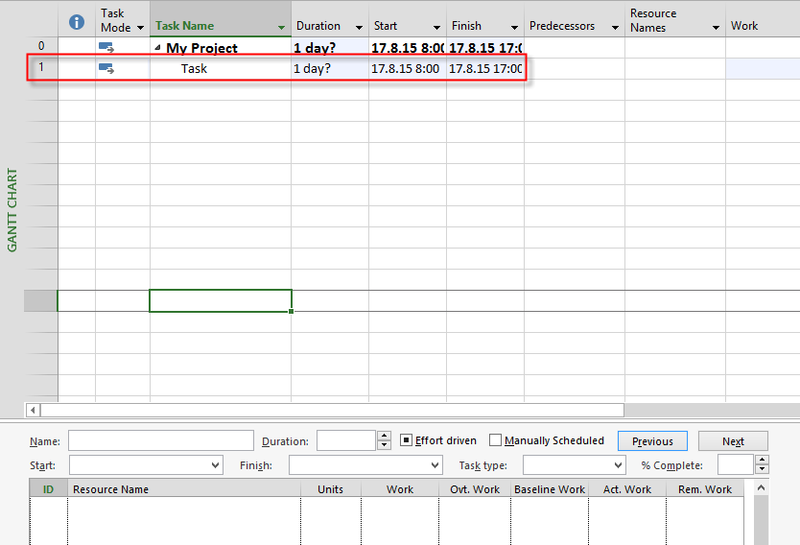 For example, for Task4 I put 32 hours, no matter who will do it! But what if you can choose between Senior and Junior? If Senior will need 32 hours, maybe Junior will need 80 hours! So, once again this is not about specific Resource! As you can see, according to Formula, Work = Duration * Units, e.g. Duration = Work / Units –> Duration = 12 hours (8 hours per day) / 100% = 1,5 day! Duration is now 1 day! Why? Paula will Work 100% (Units), and Mary 50%. So Paula will work 2/3 of 12 hours which is 8 hours, and Mary will work 1/3 hours which is 4 hours. And since the longest work is 8 hours, Duration will be (according to formula), 1 day! 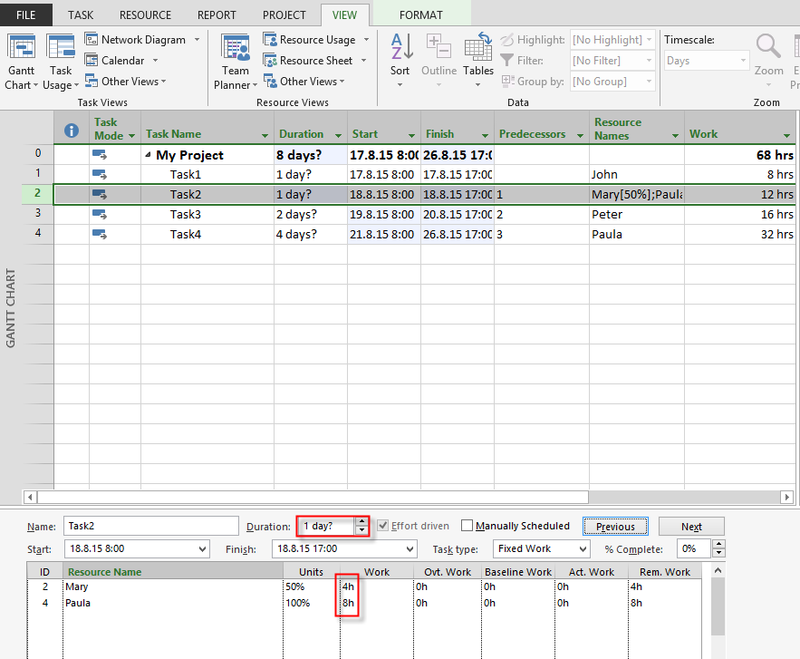 To conclude, if you don’t know (or don’t want) estimate your Tasks in Duration, but rather in work, use Fixed work Task Type, but always keep in mind that it can be tricky, because different persons will need different effort according to their knowledge, maturity etc. One Trick for you! I never put work in a work field in Gantt Chart. I always do it in Task Form for Particular Resource. 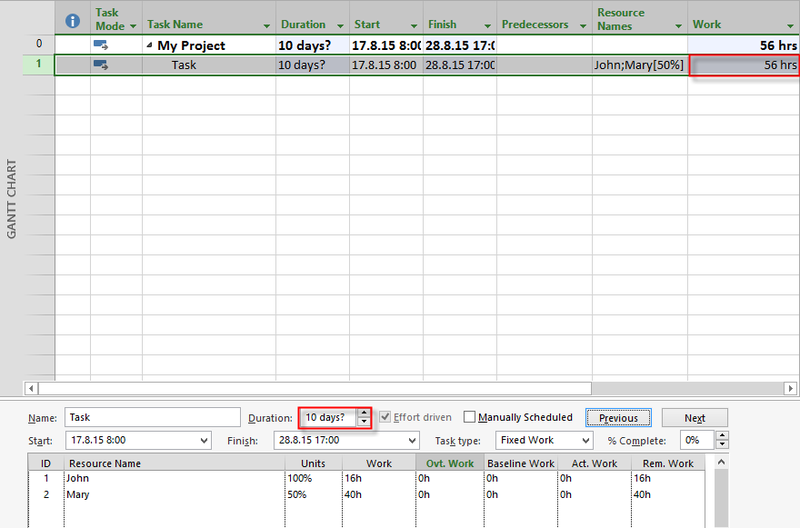 As you can see, Total work is 56 hours (John 16 + Mary 40), and Duration is 10 days, because Mary will work only 4 hours per day (50%), and that means she will need 10 working days to accomplish this Task. With this approach you will get much more precise estimating! 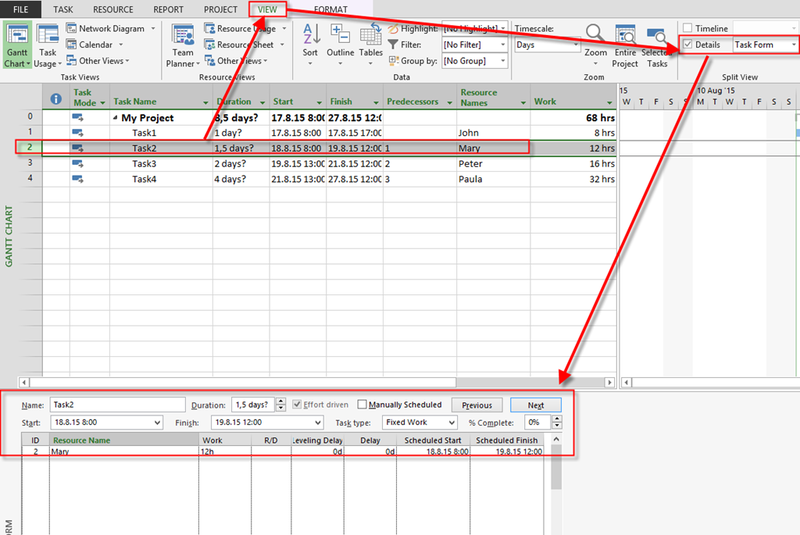 This entry was posted in MICROSOFT PROJECT, Microsoft PRoject 2010, Microsoft Project 2013, MS PROJECT 2010, PMI, PRoject Management and tagged ms project 2013; Microsoft Project 2013 - Scheduling. Bookmark the permalink.